Justin Haefner, a serial TADHack-mini Orlando winner, gave an excellent presentation at Enterprise Connect on “Embrace the API Movement”. I found it inspiring as he explained his experiences of implementing APIs within Medtronic, and the important role TADHack plays in his professional development. His key point: Enterprise Application Owners need to understand APIs enough so they can work with developers to create and maintain the API that exposes their Enterprise Application. No longer is it throwing stuff over a wall to development and waiting to see what comes back. Its working together with a developer over a couple of days to create and improve the Enterprise Application Owner’s API. 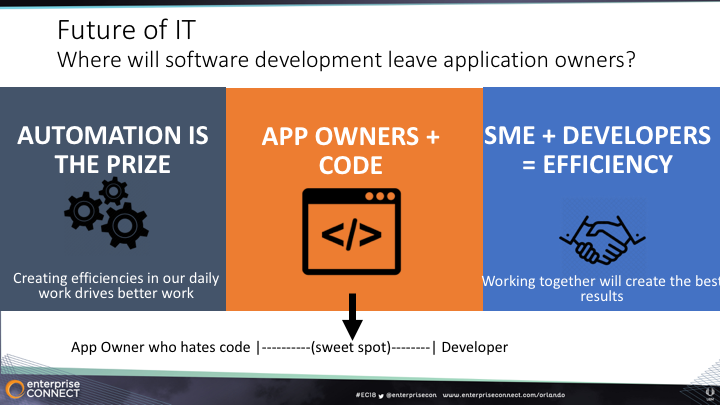 The enterprise application owner does not need to be able to code, just a common level of understanding is required. Wrong: We all need to become developers. Wrong: Developers will take our jobs. Justin crystalized the role TADHack played in his development, it helped him understand APIs. He’s able to work with developers in quickly creating APIs for his enterprise applications given a common understanding. He’s not a coder that can create a secure, scaleable API. But he knows his enterprise applications and the processes around them better than anyone else in his organization. 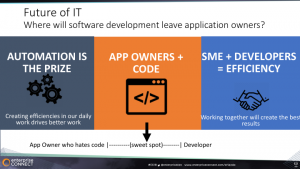 The collaboration between application owners and developers is key to the successful adoption of APIs in the enterprise. Many CPaaS providers have developer evangelist and marketing organizations that operate quite separately, they treat them as focused on two distinctly different groups of people. At TADHack we’ve not seen that separation since its founding. We see a broad range of people can use programmable telecoms, across coders and non-coders. TADHack provides the ideal opportunity for enterprise application owners to work in a team, be motivated to learn fast, and develop that common understanding in being able to read the code of the API. Its not hard, it just required that motivational event outside of the day to day work environment to make it happen. Thanks Justin for sharing your experiences, and helping me crystalize an important benefit of TADHack. To all the CPaaS developer evangelists and marketing folks, only by helping enterprise application owners work with developers can you accelerate the adoption of your APIs.